With 25 years of experience as a professional tattoo artist, Adal has become a specialist in tattoo cover ups for clients who want to mask undesirable tattoos or touch up, fix, or expand upon existing tattoos. 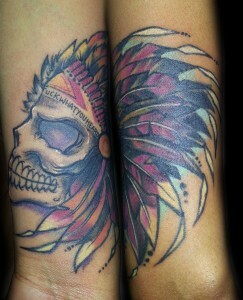 However, tattoo cover ups can be complex projects that are often more complicated than tattooing on clean skin. For this reason, there may be an additional fee applied to your cover up project. Here are several important factors to know if you are considering getting a cover up. All of Adal’s tattoo cover ups are executed as full color tattoos. Black ink on is own is not sufficient to cover up existing tattoos. The only exception is that black can cover black: tribal tattoo (big, thick, solid black) can cover smaller black tattoos. Cover ups generally require double the surface area of the existing tattoo. Some exceptions may apply, but as a general rule, cover ups must be significantly larger in order to properly cover the previous tattoo. The cover up cannot be the same size as the original piece. Because cover ups require tattooing over a large area, the tattoo project may be more extensive than the original tattoo. This might require sitting for at least two tattoo different sessions. Since the cover up is being designed specifically to cover the existing tattoo, Adal doesn’t limit the client to any particular subject matter; all subject matter is considered and can be potential cover up material. However, there are some exceptions: for example, a polar bear could never cover a tribal tattoo. Ideal imagery includes graphics or illustrations constructed of detailed line work, within which color can be incorporated. This helps color the dense areas of the existing tattoo. Some styles do not work for cover ups. Lettering, soft grey, and portraits do not work as cover ups. If you are interested in getting a tattoo cover up with Adal, please email us or fill out the form below with at least three clear images of your existing tattoo, preferably from multiple angles and in different lighting. Also, please let us know what you have in mind for a cover up image, given the information listed above.